After yesterday's news about the Bokashi and the Beasties, I think it's now time to stand up and show your appreciation for the Recyclettes. "Who on earth are they?" you might ask. Well there are loads of different types of recyclettes that you can find on Google, but my recyclettes are the fab ladies (and their families) who have risen to the challenge of The Rubbish Diet, and my goodness they've shown some commitment. They've shared stories about ditching packaging at the supermarket, taking their own containers to the butchers and getting to grips with compost bins in their gardens. After getting each of them started on their own personal bin slimming programme it's now time to catch up with the lovely ladies and find out what's been going on in their bins. And there's no better place to start than the lovely Ruby from Bury St Edmunds, our first volunteer who was brave enough to reveal her rubbish. We started Ruby's Rubbish Audit at the end of March and what a sorry state of affairs it was. Ruby revealed that she had too much packaging for her recycling bin, so the surplus was going into her landfill bin, which led to overflowing bins all round. Things were so bad that Ruby was more worried about the effect on her own environment than the world at large and by heck did it need some management. Well the great news from Ruby is that she is now the anti-excess-packaging queen. She no longer uses packaging for her children's packed lunches, unless it's reusable or recyclable. She has begun to cook more meals from scratch instead of buying ready meals and has even gone as far as ditching her packaging at the supermarket! She's also got a great site called Ruby's Rubbish Blog, where she focuses on all types of nonsense packaging and laughs at it in the same way as an organic gardener laughs at mutated vegetables. Her latest blogpost reveals that she's now doing a bit of gardening herself. Ruby gardening? Growing her own herbs and tomatoes? My word, that's a turnaround! 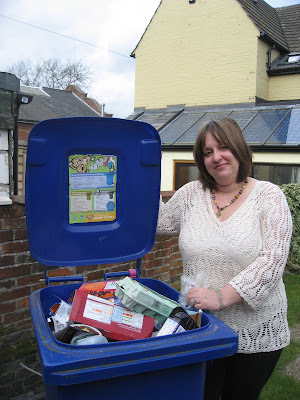 At her request, St Edmundsbury Council gave her a brand spanking new brown wheelie bin for her kitchen waste so she no longer has to send her peelings off to landfill. The other fantastic news is that all her guinea pig bedding can go in there too, so even their droppings can be put to good use. After all this effort and following her "diet plan" she has managed to reach her target with resounding success and has reduced her landfill bin by at least 50%. This means that it is now only half-full every collection day, which translates to roughly 120 cubic litres of rubbish per fortnight. All her recyclables can now fit into her recycling bin too, which is sometimes only three-quarters full these days. So hooray for the Ruby Household for such a fantastic effort. Something tells me they won't be going back to their old ways, so a round of applause please! Next, smiling at us from up north...or rather the Midlands, is the gorgeous Jo Beaufoix from Mansfield. Jo is really enjoying The Rubbish Diet challenge, which she started in May, and has had some fabulous adventures with a new compost bin to help reduce her rubbish. Jo was getting hacked off with not being able to close her bin, let alone fit all her rubbish into it. You can read about her woes here. 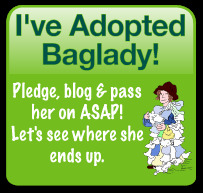 The aim was to reduce her big fat bin by 50% and the most brilliant news is that she is well on the way to reaching her target. She's been changing the way she shops, buying loose products, washing out yoghurt pots and has found a whole new excitement in nipping off to the recycling centre. The whole family has got stuck in too, sorting out the papers, bags and tetra paks. The girl's doing well. The other outcome is that her bin now has a name...Yes a name! My bin has a name too, but I never told Jo this. My bin's called Dave. Apologies to all the Daves out there who might feel offended. No offence is intended. It's just a Rubbish Diet needs the humour! I think we need to put out an apology to all the Simons too because Jo's bin is called Stinky Simon! Personally, I think anyone who's called Simon has now got a bigger problem than all you Daves. Anyway Jo has written about the adventures of Stinky Simon's diet on her very entertaining blog jobeaufoix.com. It's an essential read, which follows Simon's relationship with the bin lorry. In a very surreal way, I can't wait to find out if Simon gets his girl. So it's time to applaud Jo and Stinky Simon as well as Mr B and the little Beaufoixs for such a tremendous effort. Well done! To complete the trio, give a huge wave to the wonderful Green Family, all the way from Gloucestershire. It doesn't seem that long ago since the most wonderful Mrs Green was despairing about her rubbish and I volunteered to lend a hand. They decided to sign up for the Rubbish Diet treatment straight away. They only started a couple of weeks ago but are making astounding progress. The Greens haven't got the all singing and dancing wheelie bin down in their neck of the woods, or should I say forest (after all they live in the Forest of Dean). They have had to rely on a battered but beautiful old dustbin, who has developed a character of her own, being full to the brim and always accompanied by saddlebags! Their other challenge is that they don't have a mixed plastics recycling collection, so are having to make careful choices. However Mrs Green and the rest of the Greens have risen to the challenge in a way that goes beyond the dreams of possibilities. They're ditching the mixed plastics where possible, taking their own containers to the butchers and experimenting with all sorts to get rid of that trash. They are recycling everything they can and are managing the daily drag to the compost bin at the end of the very long garden. Within such a short period they have already hit their 50% target head on. So there is nothing stopping the Greens now and they are absolutely on a roll. They've already been featured in their local paper and have even got a whole website dedicated to their mission...yes not just a blog, but a website. 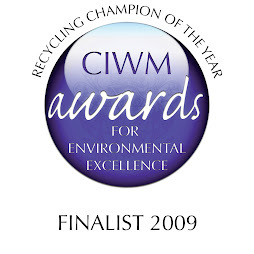 If you pop along to www.myzerowaste.com you will find competitions, as well as offers and discounts on all things that they can get their hands on. There are newsfeeds to keep you up-to-date with what's happening in the world and of course an hilarious account of how they've risen to this mighty challenge. And they have truly risen to it, because not only have they surpassed their own expectations, but they've accepted my suggestion to attempt their very own Zero Waste Week. Yes....Zero Waste. That means trying to go for one whole week without putting anything in their landfill bin at all! But we must remember Rome wasn't built in a day and it wouldn't seem fair to just thrust it upon them this quickly. So they've got a few more months to finish their rubbish work-out before attempting to go rubbish-free during the first week of September. So watch this space for news of their progress. I have every confidence they will do well. They've pulled together some fantastic support from people who are encouraging them along the way. They've even inspired another blogger to join in, the lovely Sue who also lives in Gloucestershire, who you may have also seen contributing to the discussions on The Rubbish Diet this week. Inspired by all the rubbish gossip, Sue's now set up her new blog too, Healthy Cheap Meals, Minimal Waste, where she happily shares her progress at slimming her bin and pulling together healthy meals on a budget. So do pop over and say hello. It's a sure way of saving some money too. So it's time to put your hands together again and give a huge round of applause for the Greens for everything they have achieved and so quickly. And Sue, please take your bow too. What a fabulous effort and thank you so much for joining in the fun. Blimey, what have I started? Is it a new blogging genre, a lifestyle makeover, or a revolution? Chuckle...Who knows? I guess only time will tell. But whatever it is, it's wonderfully infectious and all the families who have taken part are absolute stars. Well Ruby's at a level where she feels happy, Jo is looking forward to cutting Stinky Simon's rubbish a bit more and Mrs Green has got the most amazing project ahead of her. But what about the Almost Average Household, here in Bury St Edmunds? Well it's been nearly three months since the end of St Edmundsbury's Zero Waste Week and the big question is have we stuck to it? Er yep. It's not quite Zero or Zilch but we're still pretty close to hardly anything. Apart from a couple of dead birds, a stinky old polystyrene tray and some half-term cat litter, our weekly rubbish still amounts to about a quarter of a carrier bag. I'm not sure if I've ever revealed what we regularly throw away, so maybe the time has come...to show the contents of the Almost Average bin bag! You see, I still have SOME household rubbish, which is mainly the film from Weetabix cartons, small scraps of bubblewrap that are of little use to anyone and my junior saboteur's favourite cheese wrapper, or rather the wrapper from his favourite cheese. 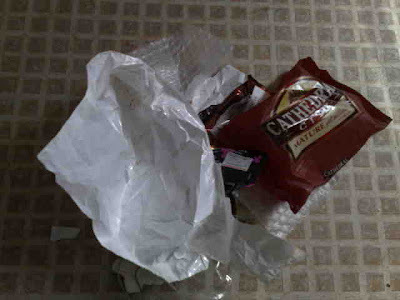 Some weeks you might find the odd crisp packet too, as well as a few cotton buds (but those will soon be eliminated as I have now found ones with paper sticks, so they can be composted). So what are our next challenges...well it's still rubbish related of course. One of my first priorities is to get myself organised so that Mr A can happily take a packed lunch to work. Call me a control freak, but I have got no idea what goes on outside these four walls as far as Mr A's diet is concerned, but I bet it's got something to do with packets of crisps, takeaways and other nasties. So you see, I've got to take control and it will bring benefits. It's going to be hard as it means some forward planning, which is really tricky for me. What makes it more difficult is that Mr A has certain tastes, which exclude sandwiches. One might suggest that he is a fussy booger, but it could also be argued that I am a lazy apeth. Between us we might find a solution, so stay tuned. However, the biggest challenge will be our household declutter. That's a project and a half, which will need patience and some careful management and a bit of bin defence! You see, when my back is turned Mr A dons his crown to become the King of Declutter, whipping himself into action to bin all of the crap and clutter in his sight and if I haven't got my wits about me it will all be destined for landfill. Now that for me will be a greater challenge than Zero Waste Week. So if there are any declutterers out there who can help me re-organise my chateau, (sorry my three bedroomed semi) you will be welcomed with open arms. And on that note, I'm off to fight my way through the mountain of kids clothes. I hope you have a great weekend. The fabulous Recyclettes and I are celebrating their fantastic progress in style and will be virtually partying all weekend (all waste-free of course). See you next week for some more rubbish updates. Well done to everyone on your progress. And thanks for the introduction! When it comes to decluttering your home have you heard of Flylady? It works for me, well most of the time! I am coming to the end of my first week and what a week it has been. Everytime I take a piece of packaging to the bin I study it, and think for a few moments.... can I reuse it? Did I need to have this piece of packaging? can I buy an alternative that doesn't come with this packaging? can I do away with it altogether? As time goes on I hope to find new ways to reuse the packaging, and think before I buy! We're the same Sue - examining every piece of 'rubbish' for better alternatives LOL! Gosh, everyone is doing SO well with this challenge. Congratulations to everyone and a hearty cheer for Mrs A for being the wind beneath or wings (or the foot firmly entrenched in our derrieres) or whatever. Keep up the great work ladies; we're making such a difference. I love that you are leaving your packaging at the checkout Ruby - I've not had that courage yet! And enjoy your gardening. Jo, I am delighted that Simon is feeling happier now. You have achieved so much with the reduction of stuff you send to the landfill. Well done! Sue, I'm really happy that you have jumped on board with your own challenge too. Yours make for a great challenge because you have a larger family, so it's inspirational for others to see that it can be done even with a larger household. Well, at present I can't get to my 2nd compost bin as dh has piled a load of timber (and various other 'junk') in front of it and I can't manage to safely clamber over it to get to it (t'other compost bin is pretty much full, so I can't add to that, it needs to sit and do it's magic). So not hugely happy today and dh is away over the weekend so there's not a huge amount that can be done! Oh well done Peter - that's a fabulous story. I love that your wife is leading by example. Well done both of you! That's fantastic news - how brilliant. Please do pass on my best wishes and full support to your wife. If you have time, I'd love to know more about the background, stuff like what was the prompt? Is it something you've been doing for a while? How much rubbish you used to throw away? Whether local recycling facilities have improved recently to make this easier? What 's been the hardest thing in your area? Hee, hee. As you can see, I'm a nosey old bird and I just love poking my nose into other people's rubbish. But I would really love to share the rest of your story if I possibly can. If there's too much to include in comments, perhaps you can drop me a line at karen@therubbbishdiet.co.uk. Oops sorry the error in the email address wasn't deliberately there to spoof the spammers (but there's an idea). Almost Mrs A, this is fantastic. Like Sue and Mrs Green I am a packaging fiend now. Do we need it? Does it need a bag? What else could we get instead? The one thing that drives me crazy is the packaging on kids toys though. I hope they'll make more of that recyclable soon. Having been a bleeding hearted tree hugging environmentalist for a very loooong while and not getting far with the message, we realised that Pam was far more media marketable than I, and far more attractive she told me. As a result she had the story of our rubbish (or lack of it) put out as a press release. To our surprise it went from the local paper to the county paper to the local radio and to the BBC in a matter of days. We have been recycling now for several years, I am a bit of a obsessive about this I am told... often... We always did throw away (I have looked for that place 'Away', never found it) very little, but sadly I we did not measure or weigh this until recently. I am sure you will enjoy investigating each of the headings. Recycling in this area is not too difficult and getting easier all the time as you will see from above. I'm now going to have a nosey at your local authority's website.